a world where everyone has a decent place to live. Donate today! Dedicated people like you can help families in need. Volunteer Now! Call our Restore for pick ups! Appointments after 4pm may be scheduled by calling our office during regular hours of operation. Our 20th home is complete! PHH breaks ground on 20th home! 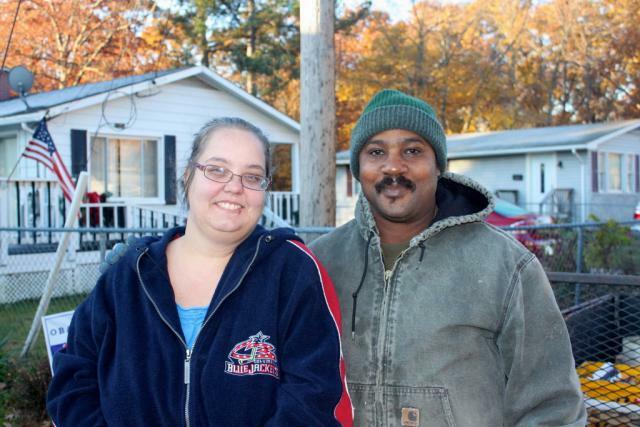 The Hampton family will be the recipients of Patuxent Habitat’s 20th new home. We are proud to partner with Patuxent Presbyterian Church, located in California, MD in building this new home on Louden Lane in Lexington Park. 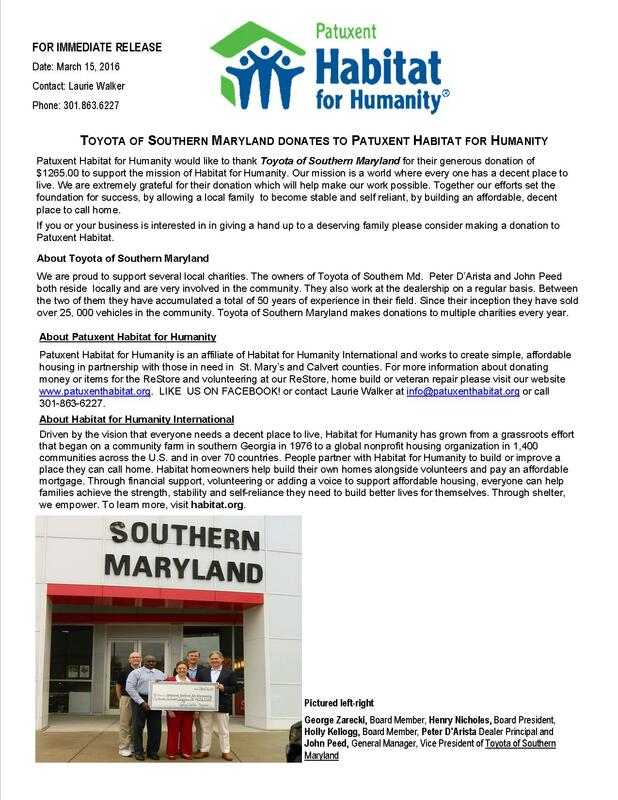 Patuxent Presbyterian has graciously offered to be the major sponsor for this build; however we still need some donations of materials, volunteers, and gifts-in-kind to make this build a success. We are working towards an Energy Star rated home so we will incorporate several “green” items into this beautiful home. We are pleased to be building and selling this home to Christina Hampton and her daughter Alexis. Christina is currently employed with AOT Public Safety Corporation in Waldorf where she has worked for three years. She is currently living in overcrowded conditions with her mom, sister, and grandparents. We will be having the Groundbreaking Ceremony July 19th, 2014 at 10 AM. 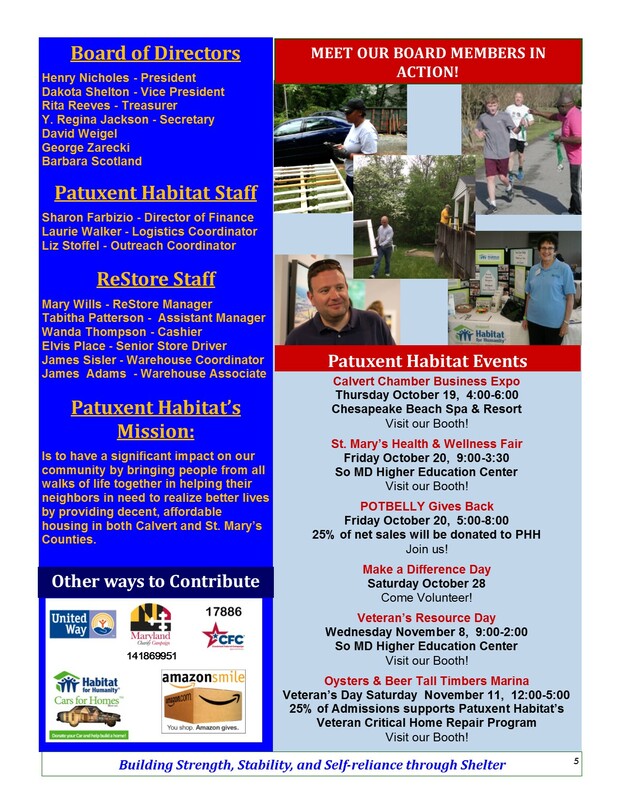 For more information about donating, or volunteering please call 301.863.6227 or check out www.patuxenthabitat.org. 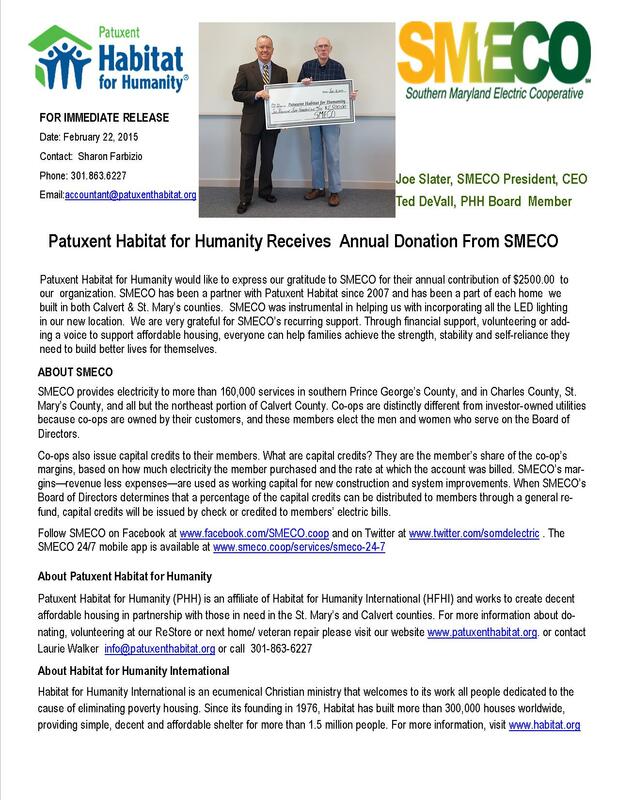 Patuxent Habitat for Humanity together with the Calvert County Board of County Commissioners will be dedicating another affordable Calvert County home just in time for Thanksgiving.Calvert/St. 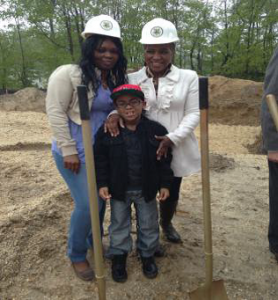 Mary’s Co. Patuxent Habitat for Humanity’s newest Prince Frederick home will soon be a Thanksgiving reality for Linda and Elleasha Ward and Elleasha’ s two sons Izayah and El’jae. The dedication ceremony will take place at 91 Mason Road, Prince Frederick, on Tuesday, November 26 at 4:00pm. This is Patuxent Habitat for Humanity’s 19th home. The lot was donated to PHH by Kaine Homes . The project was funded mainly through a Community Development Block Grant awarded to the Calvert County Board of County Commissioners, as grantee on behalf of PHH, by the Maryland State Department of Housing and Community Development. 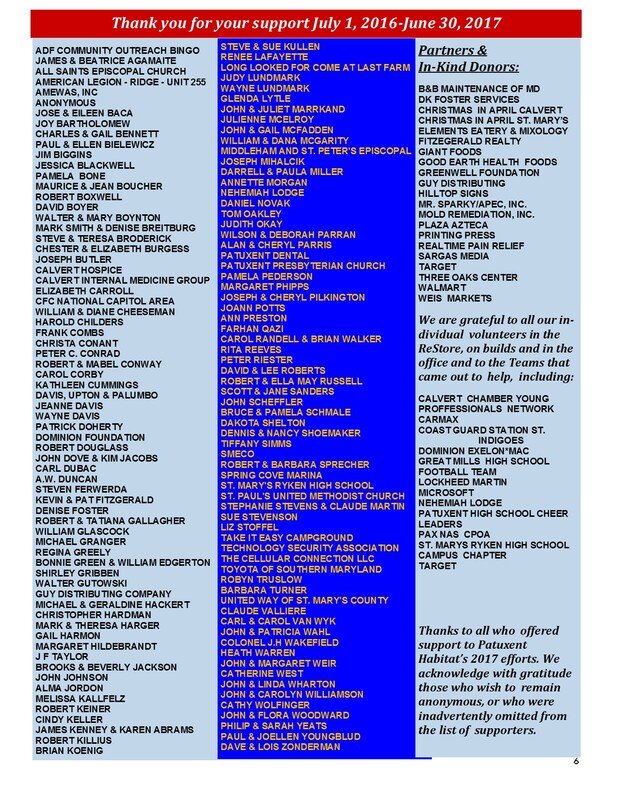 PHH would like to extend our profound thanks to the BOCC and the Department of Community Resources for their assistance and support with the grant process. 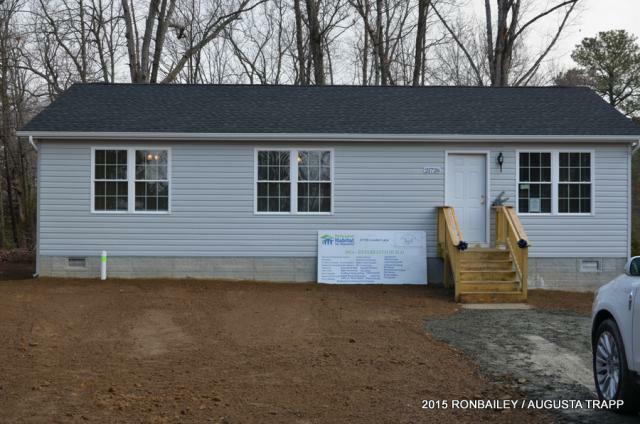 Patuxent Habitat for Humanity set to dedicate the Bob Douglass Memorial/ Interfaith Build home in cooperation with Calvert County Churches. On Saturday November 23, 2013 at 11:00 am, at 221 Helena Dr. 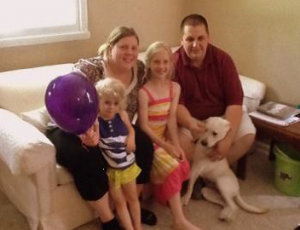 Prince Frederick, Patuxent Habitat for Humanity will dedicate its 18th home to the LaVorgna family. John, Katie, Ella & Mia will be home for the Holidays! 18th home to the LaVorgna family. John, Katie, Ella & Mia will be home for the Holidays! This affordable home renovation was made possible by the Bank of America Foundation, several Calvert County Churches, and the Bob Douglass Memorial Fund. Bob Douglass was a beloved friend, & extremely gifted volunteer, who passed away earlier in the year. Because of the generous donations of his family, and friends we named this Interfaith Build home after him. 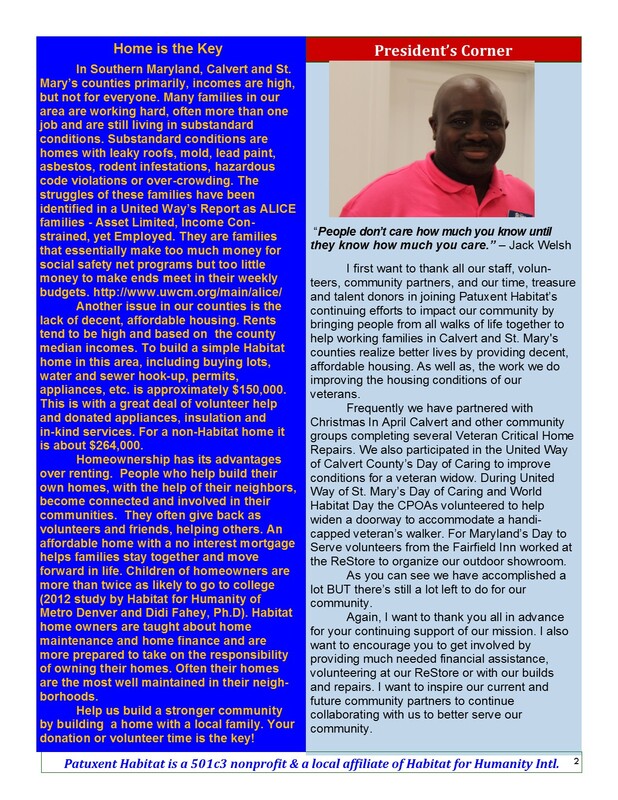 The Douglass family and friends continue to support the Patuxent Habitat for Humanity mission. Our Vision: A world where everyone has a decent place to live. Our Mission Statement Seeking to put God’s love into action, Patuxent Habitat for Humanity brings people together to build homes, communities and hope. Patuxent Habitat for Humanity is part of a global, nonprofit housing organization operated on Christian principles that seeks to put God’s love into action by building homes, communities and hope. Patuxent Habitat for humanity is dedicated to eliminating substandard housing locally and worldwide through constructing, rehabilitating and preserving homes; by advocating for fair and just housing policies; and by providing training and access to resources to help families improve their shelter conditions. Habitat for Humanity was founded on the conviction that every man, woman and child should have a simple, durable place to live in dignity and safety, and that decent shelter in decent communities should be a matter of conscience and action for all. All are welcome Patuxent Habitat for Humanity has an open-door policy: All who believe that everyone needs a decent, affordable place to live are welcome to help with the work, regardless of race, religion, age, gender, political views or any of the other distinctions that too often divide people. In short, Habitat welcomes volunteers and supporters from all backgrounds and also serves people in need of decent housing regardless of race or religion. As a matter of policy, Habitat for Humanity International and its affiliated organizations do not proselytize. This means that Habitat will not offer assistance on the expressed or implied condition that people must either adhere to or convert to a particular faith, or listen and respond to messaging designed to induce conversion to a particular faith.Patuxent Habitat for Humanity has an open-door policy: All who believe that everyone needs a decent, affordable place to live are welcome to help with the work, regardless of race, religion, age, gender, political views or any of the other distinctions that too often divide people. In short, Habitat welcomes volunteers and supporters from all backgrounds and also serves people in need of decent housing regardless of race or religion. As a matter of policy, Habitat for Humanity International and its affiliated organizations do not proselytize. This means that Habitat will not offer assistance on the expressed or implied condition that people must either adhere to or convert to a particular faith, or listen and respond to messaging designed to induce conversion to a particular faith. About Habitat for Humanity International: Founded in Americus, Georgia, USA, in 1976, Habitat for Humanity today operates around the globe and has helped build, renovate and repair more than 600,000 decent, affordable houses sheltering more than 3 million people worldwide. In 1985, the United Nations declared the first Monday in October to be World Habitat Day to recognize the critical housing need around the world. Habitat for Humanity knows that good housing and good housing policies are crucial to creating safe and strong communities and that adequate shelter is a critical foundation for breaking the cycle of poverty. This year, World Habitat Day falls on Oct. 7. Now more than ever, we need your support. • Worldwide, 1.6 billion people live in substandard housing conditions. About one in four of all people live in conditions that harm their health, safety, prosperity and opportunities. • If the trend is not curtailed, the number will grow to 3 billion living in substandard housing by 2030, or 40 percent of the world’s population. • Estimates of homelessness in the United States vary from 1.6 million to 3 million people. Most studies conclude that about one-third of the homeless are children. • Habitat works in more than 1,500 communities in the United States, and in more than 70 countries worldwide, from Argentina to Zambia. • Every 5 1/2 minutes, Habitat serves a family in need of better housing. • Habitat has helped more than 3 million people since our founding in 1976. 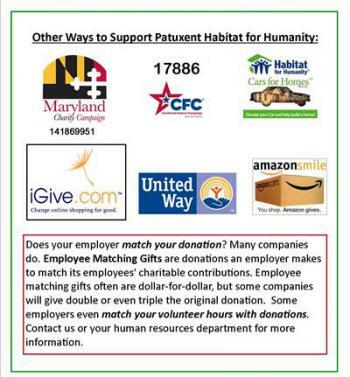 • Make a donation to Patuxent Habitat for Humanity by visiting www.patuxenthabitat.org/donate . 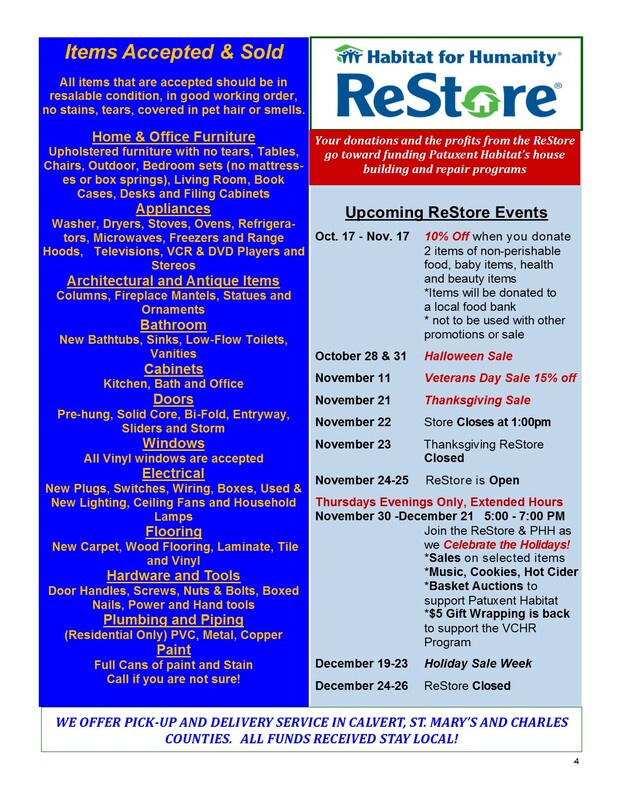 • Visit or contact the Patuxent Habitat for Humanity ReStore located in Lexington Park, and help support the mission by shopping, donating, or volunteering. Donation Pickups are available for Saint Mary’s & Calvert Counties. Call 301-737-6273 to schedule your donation pickup. • Share your commitment on your social media network, and invite your followers and friends to find out more about Habitat for Humanity. With your help, we can improve lives and communities — at home and around the globe. Together we can make a difference. 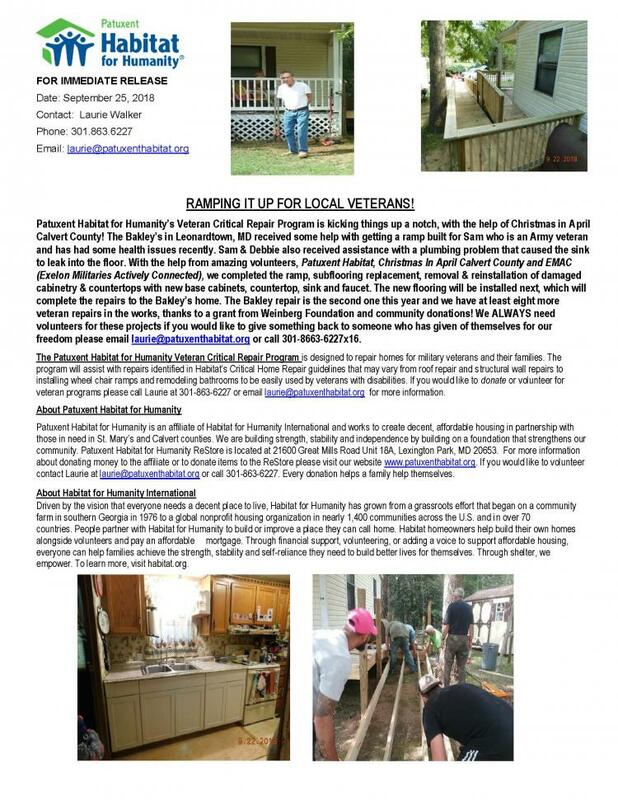 Patuxent Habitat for Humanity completed a 21-day extensive handicap accessibility renovation for Navy veteran Chad Madden with funds awarded from The Home Depot Foundation Veterans Repair program. Jim Bacot, owner of Brooks Run Builders renovated Madden’s bathroom into a wet room, widened two doors and moved an existing wall and hallway, increasing living space and accessibility throughout his home. Andy Shizak, architectural designer of Blake Creek Design, drew up the renovation plans. 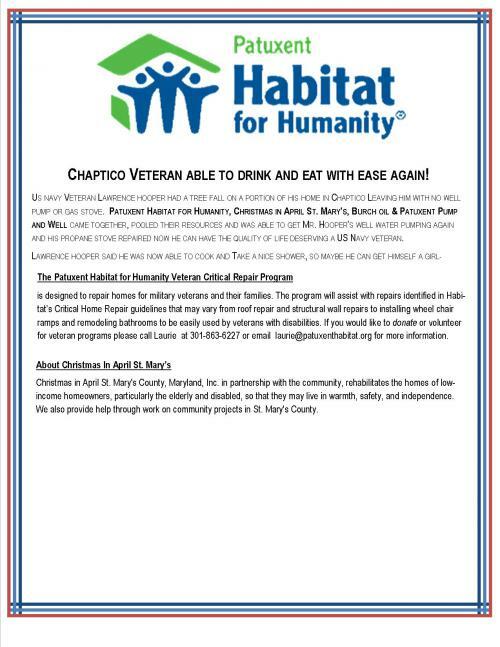 Habitat for Humanity partnered with The Home Depot Foundation has begun work on a deserving U.S. Army veteran in Hungtingtown, MD. 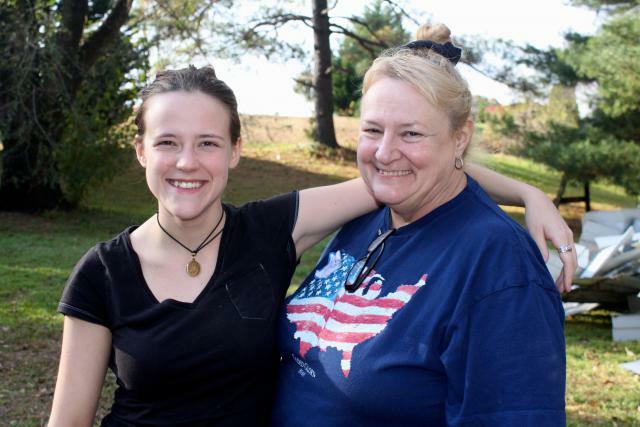 The veteran, Ms. Cindy Whitehurst and her daughter Faith, have been living in the home since 1999. Cindy is employed part-time as a nurse’s aide and due to financial constraints; she has been unable to afford any critical repairs made to the house. 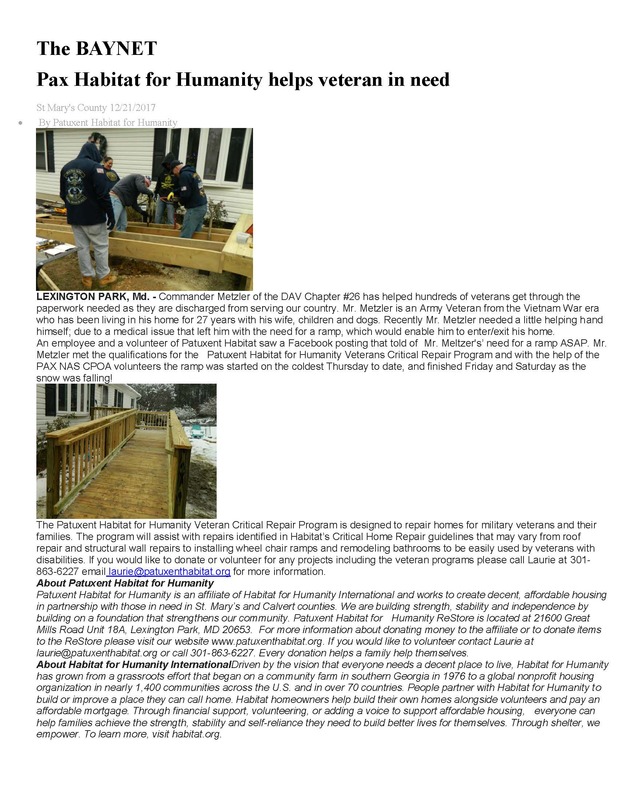 Because of the Home Depot Foundation program and a volunteer corps, PHH is replacing her roof, mitigating a serious mold problem, demolishing an unsafe deck and installing a new one, adding required insulation, along with a few other minor items such as grading and drainage repairs. 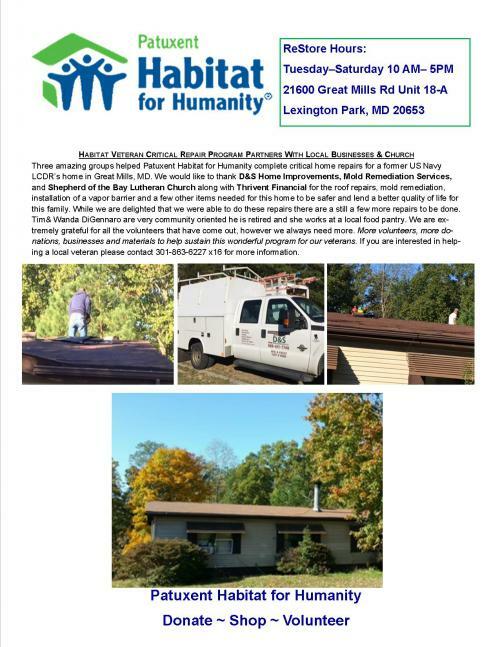 On Friday and Saturday, 16 & 17 November 2012, through a grant from Thrivent Financial, Thrivent Builds, Patuxent Habitat for Humanity (PHH) will be assisting another well deserving veteran, Mr. Leonard Mackall in Lexington Park, MD. Thrivent Builds Repairs is one program in the Thrivent Builds with Habitat for Humanity portfolio. It aligns and partners with Habitat for Humanity International’s Neighborhood Revitalization Initiative. Thrivent Builds with Habitat for Humanity is a multiyear, multimillion-dollar volunteer and advocacy partnership between Thrivent Financial for Lutherans and Habitat for Humanity International.Mackall in Lexington Park, MD. Thrivent Builds Repairs is one program in the Thrivent Builds with Habitat for Humanity portfolio. It aligns and partners with Habitat for Humanity International’s Neighborhood Revitalization Initiative. Thrivent Builds with Habitat for Humanity is a multiyear, multimillion-dollar volunteer and advocacy partnership between Thrivent Financial for Lutherans and Habitat for Humanity International. Volunteers from Patuxent Habitat for Humanity and Thrivent Lutherans will partner along with Christmas in April volunteers who all will generously donate their time and talents to ensure our veteran homeowner, Mr. Mackall, an Army National Guard member, will have the much needed repairs done to his home. This partnership from three different agencies has come together for the common good to ensure Mr. Mackall will have new siding on his house in two days. PHH, Thrivent Lutherans and Christmas in April volunteers will strip the old siding from the house, Tyvek wrap and seal his house and install flashing around the windows to prevent moisture from coming into the home. Tyvek wrap and seal his house and install flashing around the windows to prevent moisture from coming into the home. 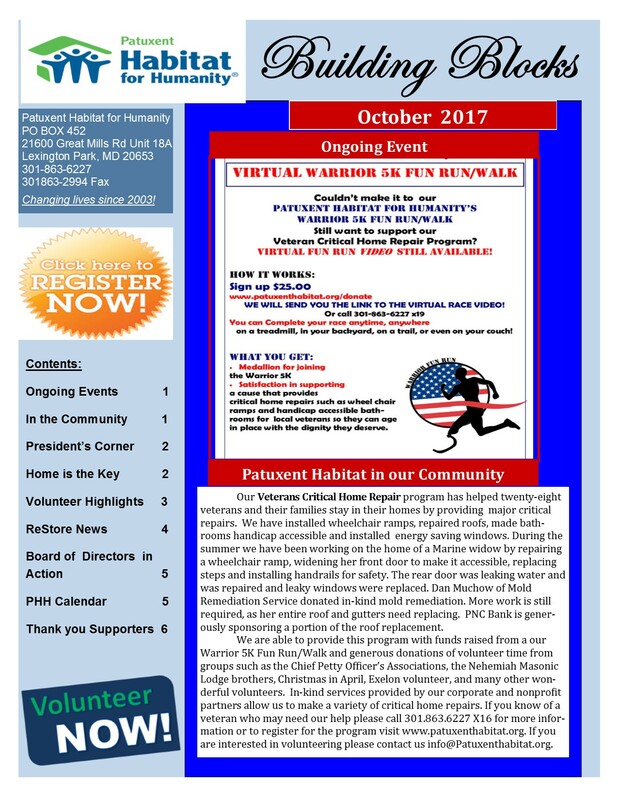 PHH is incredibly grateful for the dedication and commitment from the volunteers coming from the St. Mary’s and Calvert Counties communities. PHH recognizes that our core strength in the community is our volunteers and we could not be more thankful to align ourselves with our Thrivent Lutherans and Christmas in April partners. 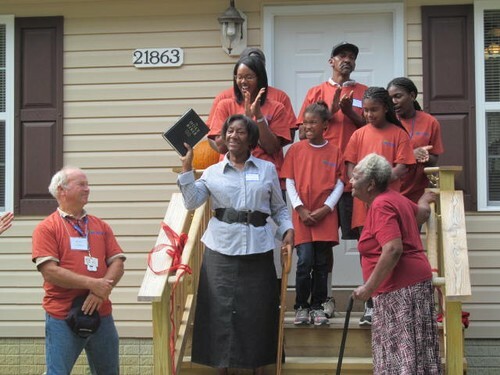 Mary King and her family received the keys to their new home Monday October 1st, 2012. 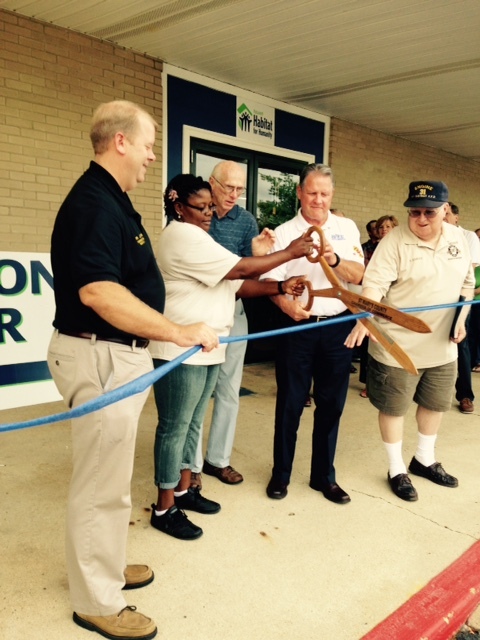 They are the proud owners of the latest Patuxent Habitat for Humanity project in Lexington Park, the second house built by Chief Petty Officers from Patuxent River Naval Air Station and other volunteers. More than 300 volunteers contributed over 2,000 hours of their time on the project. Among them was St. Mary’s County Commissioner Cynthia Jones, who attended the ribbon cutting ceremony Monday at the home Milton Lane which sits next door to the first Chief’s Build home. Commission President Francis “Jack” Russell was also on hand. United Nations established World Habitat Day in 1985 to spotlight the need for adequate shelter worldwide. 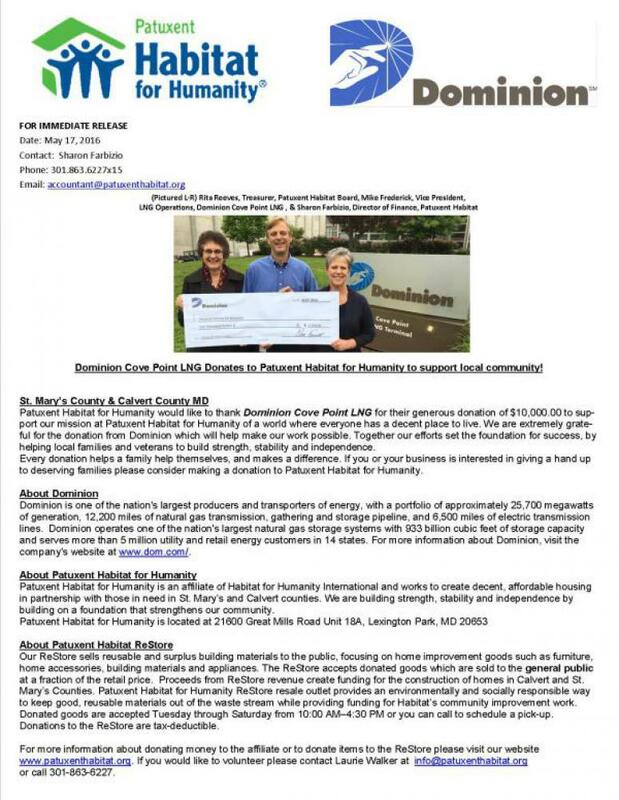 Patuxent Habitat for Humanity is an affiliate of Habitat for Humanity International, founded in 1976. They have built more than 400,000 houses worldwide since then. The King home is the 15th home built from the ground up by Patuxent Habitat for Humanity in St. Mary’s and Calvert counties. 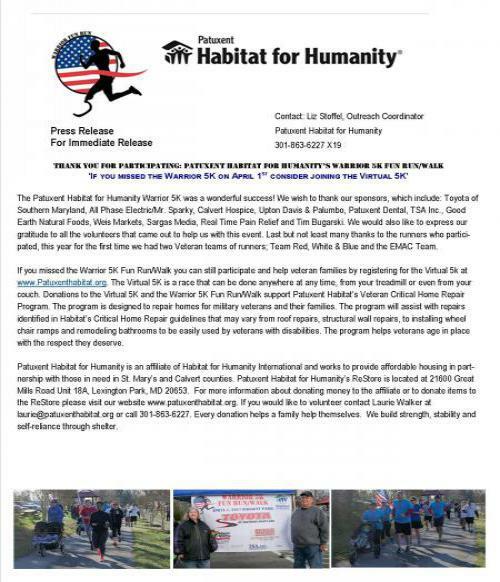 Patuxent Habitat for Humanity (PHH) will dedicate the first home in the Gary Senese Memorial Veterans Repair Corps project on Saturday, Aug. 25 at 10:00 a.m. at the home of Caleb Getscher. 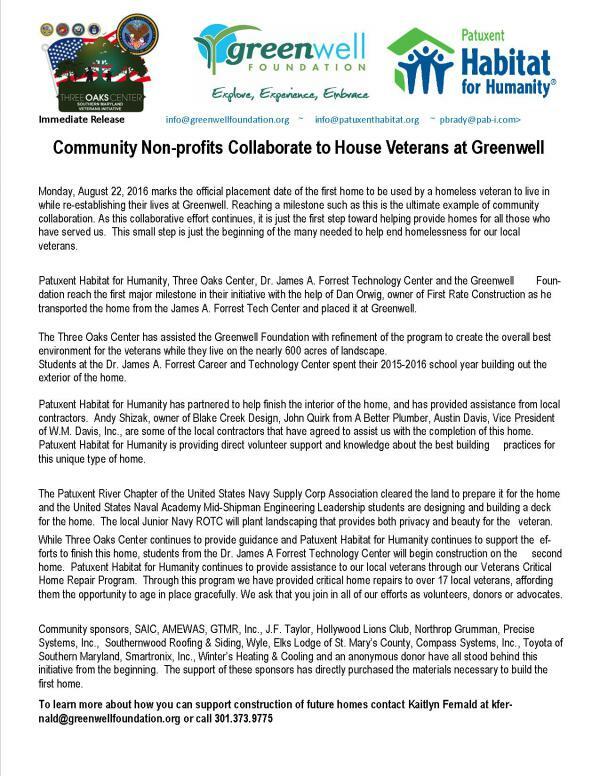 Donors, elected officials, volunteers and community stakeholders will join the PHH Board and staff at the ceremony. Repair Corps, a joint project between Habitat for Humanity and The Home Depot Foundation® remodels and renovates the homes of U.S. military veterans. Repair Corps grants pay for needed home repairs including insulation, weather stripping, installing wheelchair ramps and renovating bathrooms and doorways to accommodate disabled veterans. Larger repairs such as roofing, electrical, plumbing, HVAC and structural improvements are also available. 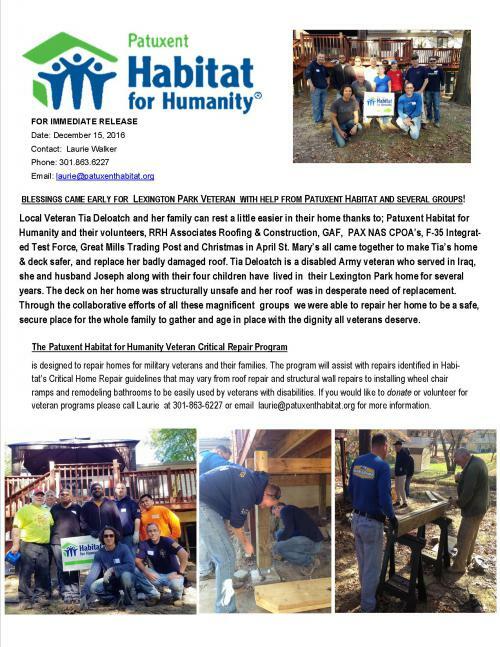 Patuxent Habitat for Humanity was recently selected to participate in the second year of the Repair Corps by Habitat for Humanity International and The Home Depot Foundation to remodel and renovate homes of U.S. military veterans in St. Mary’s and Calvert counties. Patuxent Habitat for Humanity can spend up to $15,000 per home on critical home repairs. The affiliate is taking additional applications for assistance. 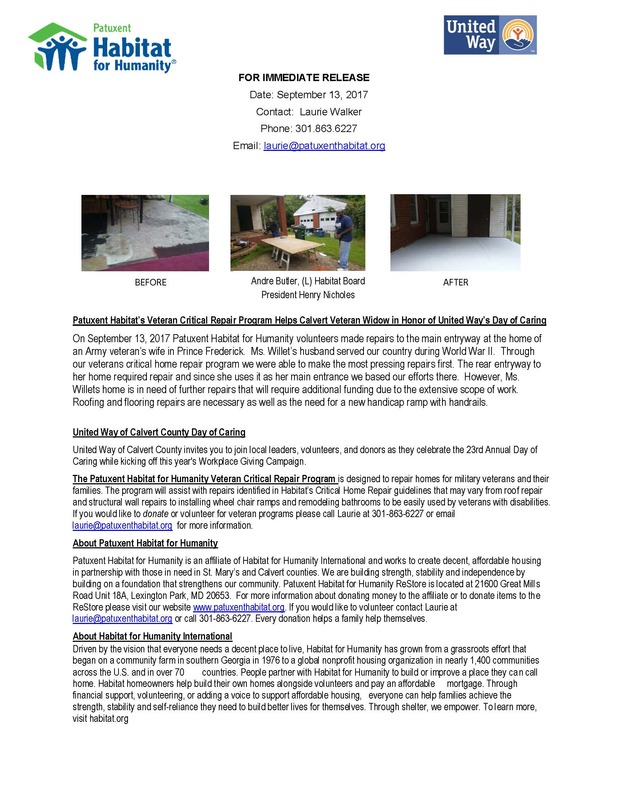 Patuxent Habitat for Humanity is asking for assistance from volunteers or cash donations to the Repair Corps program. The program uses the same model as new homes built for Habitat families; veterans will repay the zero interest loan necessary for these repairs, which is then deposited into a revolving fund to assist additional families in need of decent housing. Repayment will be on a sliding scale based on family income. For more information, visit www.patuxenthabitat.org or call 301-863-6227 or 410-326-9050. 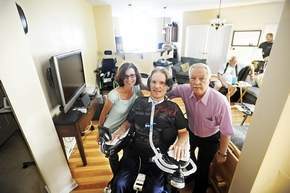 Getscher’s home is now more accessible for Caleb to live comfortably. Lots of volunteer labor built an addition onto the house that includes a bathroom and living space. This project’s cost exceeded the grant, but a solicitation from local organizations successfully raised the funds needed. Patuxent River Naval Air Station military personnel, led by Matt Kulp of Galaxy Homes, along with some Mennonite neighbors and many steadfast volunteers completed the project. 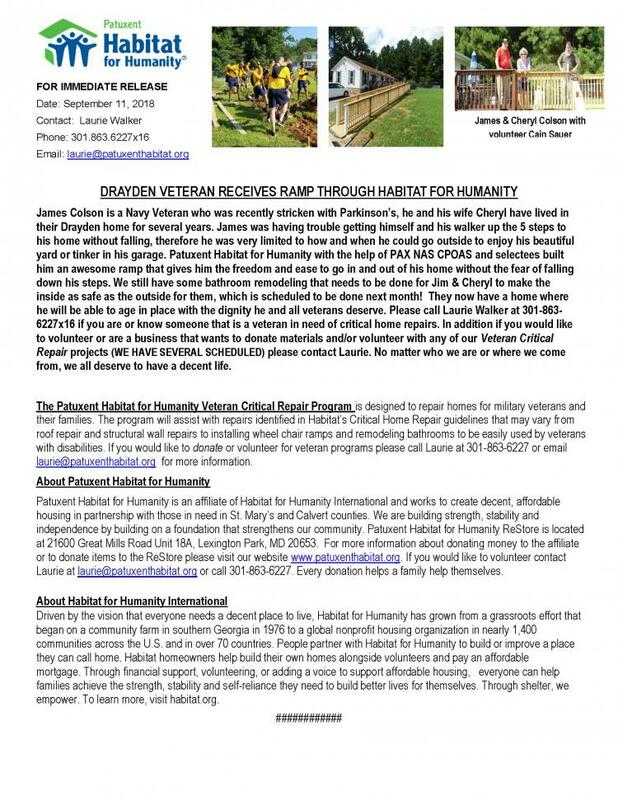 Patuxent Habitat for Humanity is dedicating its participation in the program to Gary Senese of Compton, a Habitat volunteer and former Marine who died last summer. Media are encouraged to attend—please call the Patuxent Habitat for Humanity office for directions. housing in St. Mary’s and Calvert counties for families who would not otherwise be able to afford a home. 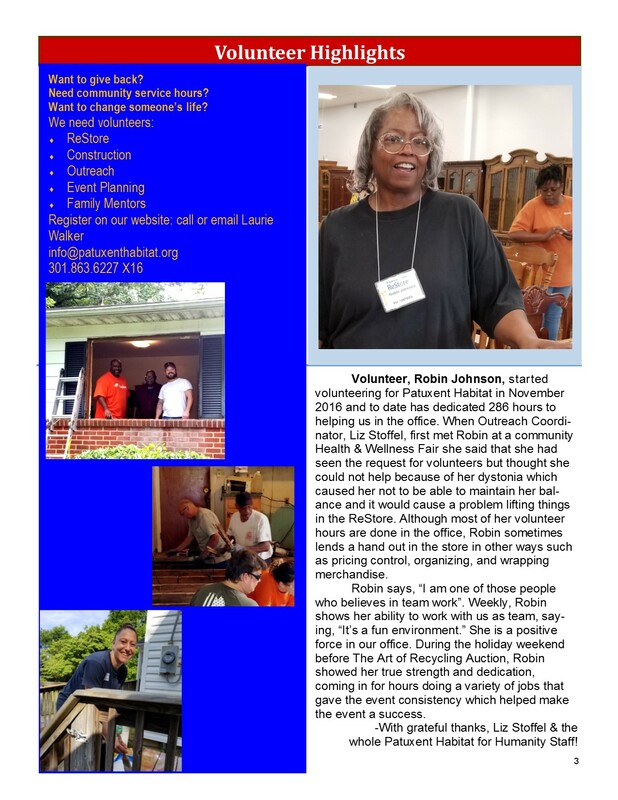 For more information about donating, volunteering or applying for a home, log on to www.patuxenthabitat.org or call 301-863-6227 or 410-326-9050. The Home Depot Foundation is committed to ensuring that every U.S. military veteran has a safe place to call home. 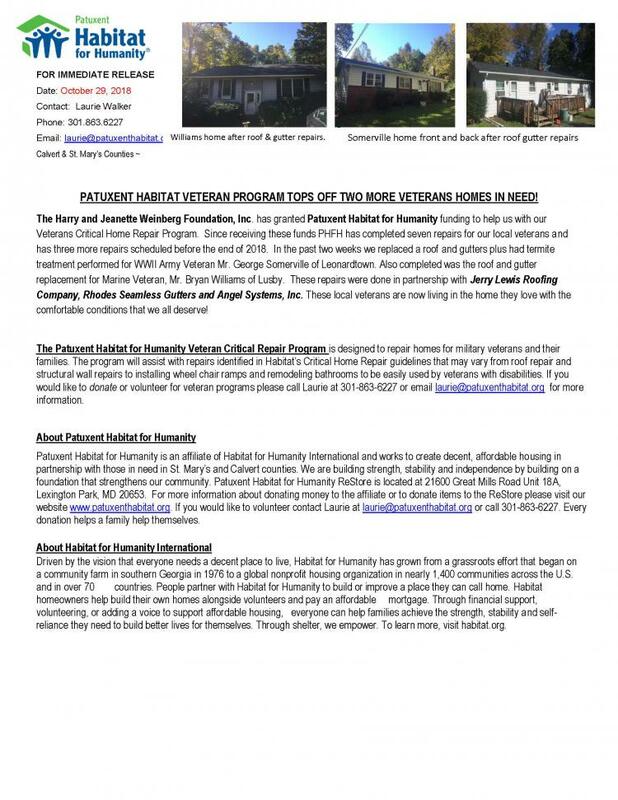 In April 2011, the Foundation pledged a three-year, $30 million initiative to address veterans’ critical housing needs. Since its formation in 2002, The Home Depot Foundation has granted more than $270 million to nonprofit organizations improving homes and lives in local communities. To learn more and see our associates in action, visit homedepotfoundation.org, follow us on Twitter @homedepotfdn, and like us on Facebook at facebook.com/homedepotfoundation. About Habitat for Humanity International Habitat for Humanity International is an ecumenical Christian ministry that welcomes to its work all people dedicated to the cause of eliminating poverty housing. Since its founding in 1976, Habitat has built more than 400,000 houses worldwide, providing simple, decent and affordable shelter for more than 2 million people. 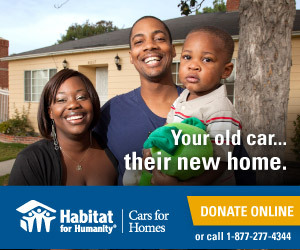 For more information, visit Habitat.org. © 2015 - Present All Rights Reserved. A suite of fundraising, donor, volunteer, membership, event, and mailing campaign management tools fully integrated with a website designed for NPO's.